The Alamo was a crucial battle during the Mexican-American War. In the fall of 1835 Mexican Soldiers came to Gonzales, Texas to get a cannon that they had loaned to Americans. The Americans however did not want to return the cannon and they opened fire on the Mexicans. This was said to start a revolution in Texas. Santa Anna was the president of Mexico at the time of the war. Santa Anna raised a huge army and marched them to San Antonio on February 23, 1846. The place that the Texans and the Mexicans met at was the Alamo. The Alamo was an old community shelter that was in ruins. The Mexicans fired at the Texans first. The battle lasted for twelve days. The Texans never received backup and it left them with about 300 men to defend the thousands that the Mexicans had. 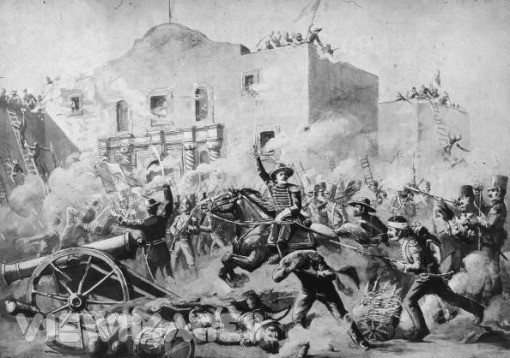 After eleven days there was 200 Texans to face the 5,000 Mexicans. Davy Crockett had all his men march single file out into an empty space and he drew a line in the ground with his musket. He told everyone who wanted to fight to come onto the other side with me. Everybody came over with Crockett and a man who was on his death bed made two men carry him over to the other side to fight. The Mexicans won the battle on the twelfth day. They killed every Texan that fought and captured all the women and children. The Texans however weakened the Mexican army severely and was able to defeat them 46 days later and signed the Treaty of Guadalupe Hidalgo, which gave American all the land west of and including Texas for only $15 million.